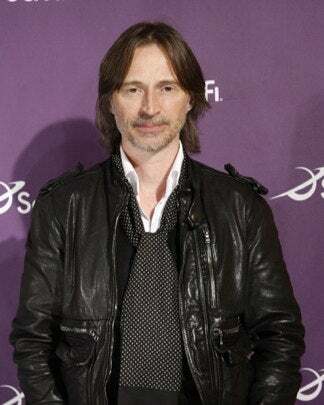 We were excited to catch up with Robert Carlyle, the eldest castmember of the new Stargate Universe clan, at the Sci Fi Channel Upfronts. Thankfully, this seasoned actor spared a few moments to set us straight about SGU — turns out it's full of death and darkness and a very funny David Blue. We know so little about your character. What else can you tell us? I play Dr. Nicholas Rush. He's a scientist. He's a little bit in his mind, but he has his reasons, which will remain secret for the moment. I guess what makes this Stargate different from the previous shows in the franchise is, it's a lot darker than the other ones. This has less to do with interaction with an alien race and more about survival on the ship itself. Rush takes these people through the Stargate onto what they think is another world, and in fact it's actually a ship. It's a massive ship called called Destiny. It was a ship that was launched hundreds of thousands of years ago by the Ancients themselves, and is now floating through space. No one was ever meant to be there. The team that is there is ill-equipped to be there. So the first six or seven episodes are actually all called "Air," "Fire," "Water" and "Earth" because it's about surviving amongst that, it's more drama-based and more character-driven. From what we've read it sounds like there is a darker angle, can you expand about how much more darker these characters really are, will we be actually dealing with death? Certainly, certainly. In the first three hours there are three deaths. It's very heavy. There's a suicide by episode six, as well. Because these people are in the far reaches of the universe, never to come home. That's the thing Rush explains, that it's impossible to go back. And they don't know where else to turn. And you said your character is a bit out of his senses? Well not really, from his point of view, but the others think that he's maybe losing it. But he does things for a reason. Who have you enjoyed working with on this cast? We've got a great cast [including] Justin Lewis. David Blue is a terrific young actor. Brian J. Smith, he's new but he's terrific also. Elyse [Levesque] is the best. Alaina Huffman... there are some terrific actors there. And we had to, because as I said this show is about about the characters and has less to do with alien races. Do you still get to keep that wonderful Stargate banter that we all treasure so much? David Blue, particularly [does]... he's naturally funny anyway, he plays a kind of a comic relief, I guess, on the show. We knew it! His character as the "slacker genius" sounded so much like a young McKay, but we know Blue will make it his own, plus he was adorable on Ugly Betty. Thank you Robert Carlyle with all this darkness talk my expectations are climbing higher than they've ever been before. I mean holy cow that's a lot of deaths, plus a suicide, should be interesting. Perhaps in this series the dead will actually stay that way. I believe in you SGU, bring on your dark Gate, we're ready. Picture from Subduction Leads To Orogeny.